Orlando was down to “get schwifty” on Tuesday as the Rickmobile from the popular Adult Swim show, “Rick and Morty”, pulled up in front of the Coliseum of Comics in Millenia Plaza. The Rickmobile is a truck covered with a huge replica of one of the show’s leading protagonists, Rick, who plays an alcoholic mad scientist. The truck travels the country making frequent stops to sell merchandise to fans. It’s all part of the show’s “Don’t Even Trip Road Trip”, which vows to “bring the store to your door”. 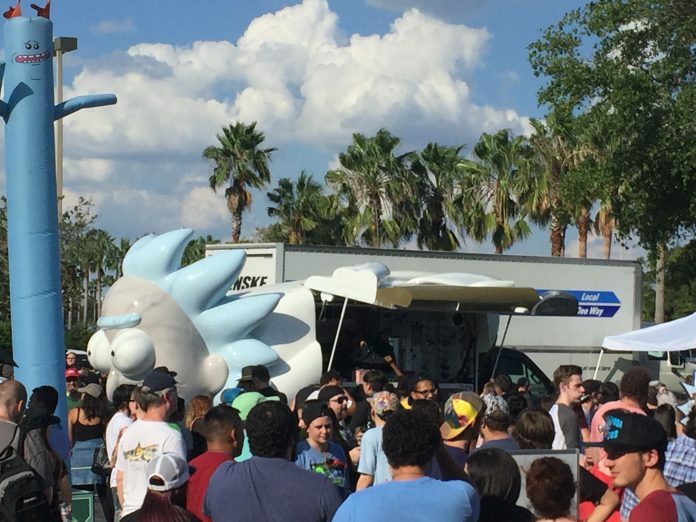 The Rickmobile was scheduled to arrive at 5 p.m., but by 4:30 there was already four lines being formed, each with hundreds of people. They began giving out numbers for line positions hours before, and by 1:00 there were already 150 numbers distributed. The wait to buy merch was a lot longer than “rixty minutes”, but fans were determined. In fact, they were so eager to express their love for “Rick and Morty” that many showed up in costume. In honor of the Rickmobile,Barker decided to channel his inner Rick Sanchez, and go all out for the event. 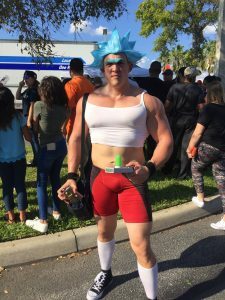 Everyone from businessmen taking a quick break from work to little kids in Rick wigs came out to grab some merchandise and to get “riggity wrecked” with fellow fans. UCF students were also out showing their support for the franchise. The Rickmobile also helped local business.